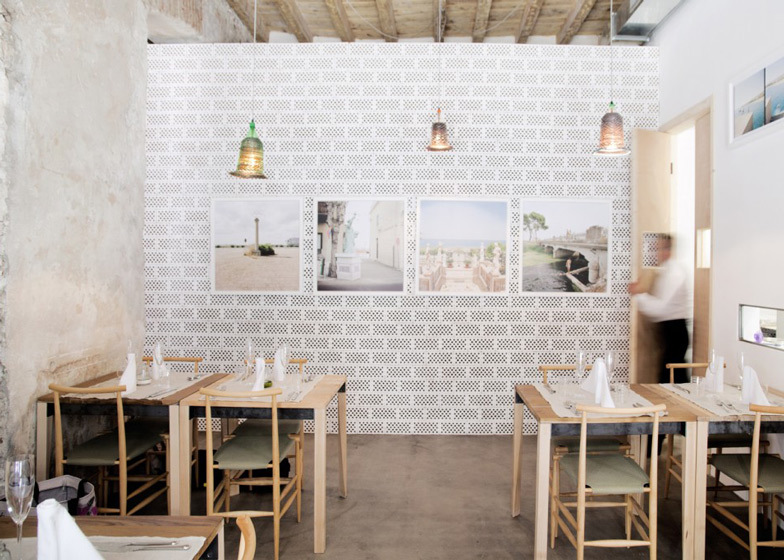 This little restaurant in Milan was designed by Italian architect Francesco Faccin and built by inmates from a local prison (+ slideshow). 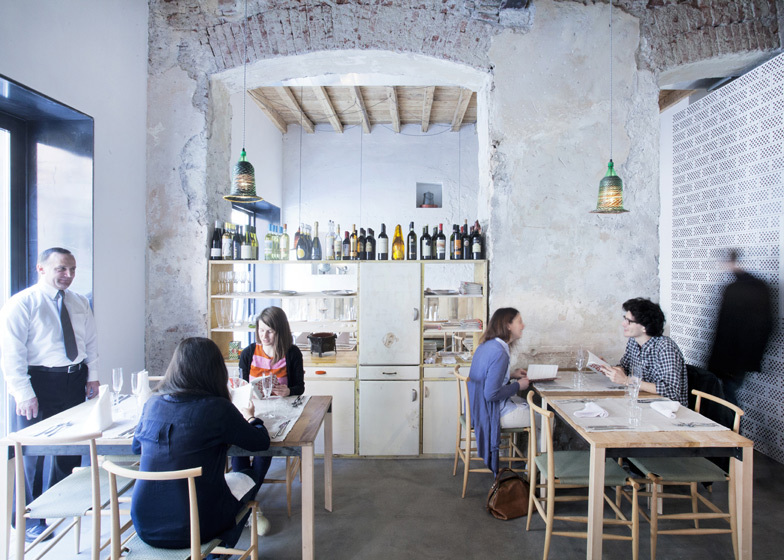 Named 28Posti, the restaurant occupies a former karaoke bar in Milan's Navigli neighbourhood and opened in April to coincide with the Salone Internazionale del Mobile. 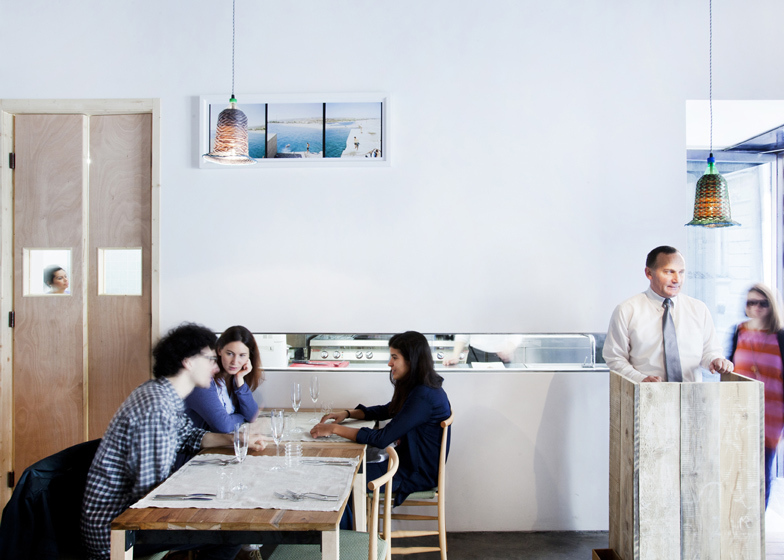 Francesco Faccin designed the interior, retaining the peeling plaster and exposed brickwork of the existing walls and adding wooden seating and fixtures as well as a concrete floor. Working alongside Maria Luisa Daglia and Gaetano Berni of charity organisation Live in Slums, Faccin enlisted a team of prisoners from the nearby Bollate Penitentiary to build all the furniture for the restaurant, tutored by carpenter Giuseppe Filippini. The Bollate inmates used recycled timber offcuts to build tables, sideboards, doors and wall panelling. Three members of the team also helped to strip and clean the structure, pour the concrete floor and fit the windows and furniture. 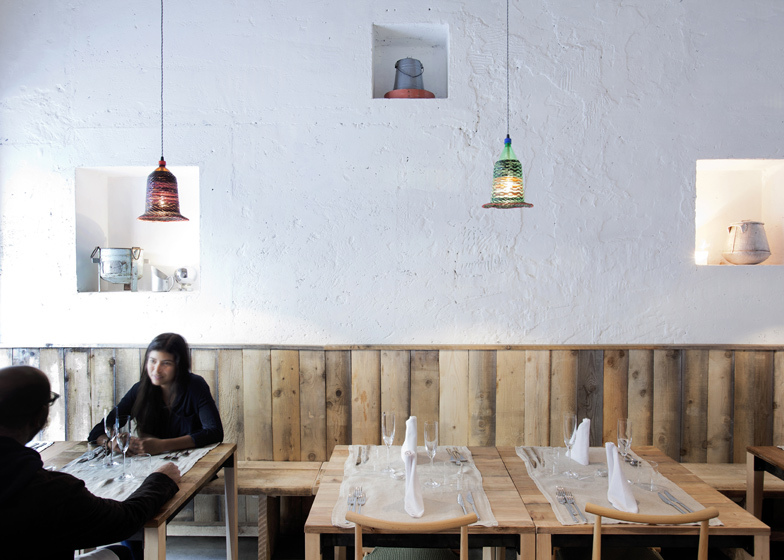 "[One of] the restaurant's objectives is to become a showcase of these furnishings in order to create a direct sales network with the Bollate's penitentiary workshop," explains the 28Posti team. To complete the space, pendant lights made from recycled plastic bottles are suspended over each of the tables, while Kenyan objects and sculptures are placed within recesses in the walls. See more eateries on Dezeen, including a restaurant filled with a weave of colourful strings and a pizza bar lined with ceramic tiles. Photography is by Filippo Romano. The restaurant room is cosy and intimate, only 28 covers. It is located in a quiet street in the core of Navigli's neighbourhood, precisely where in the past was located the historical club "Karaoke Canta Milano". The architectural project is designed according to the original spatial characteristics and it is supplied with furniture entirely produced with waste materials. The kitchen is the soul of the project: the guests can have access to it through a quick passage at the entrance and though a loophole in the main room which reveals the preparation of foods. Our cuisine is oriented toward ethical values, attentive to the quality of food, the respect for the environment and the fairness of the production processes. The convicts of the penitentiary who have been able to benefit from the Art.21 could participate to the construction process. After this important experience, the restaurant will continue to be devoted with diligence to the reinstatement of disadvantaged groups.